This One Bowl Apple Cake is as easy as 1-2-3. Just put all the ingredients in a bowl, mix and bake. 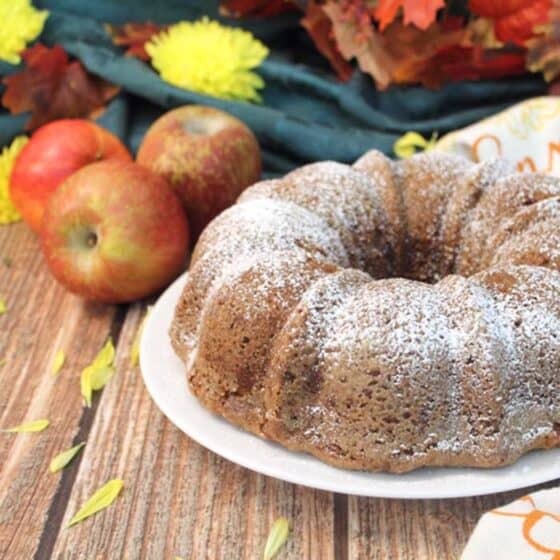 It comes out moist, delicious and fills the house with the aromas of apples & cinnamon. Preheat oven to 300 degrees. Grease & flour a bundt pan. In a large bowl, mix ingredients in order given. Batter will be very thick. Bake 1-1/2 to 1-3/4 hours or until pick in center comes out clean. Place on wire rack to cool for about 20-30 minutes. You want it to be firm enough to not fall apart when it is inverted. When cool enough remove from pan and place on wire rack to finish cooling completely. Dust with powdered sugar just prior to serving.